Sleepless nights, Endless dreams, Timeless work, Ruthless world, and Peace less life. These words describe the life we have today perfectly. We all are running in a rat race of being the best and are working endlessly for it, but while we are it, we tend to forget a quote by Jane Wagner that “Even if we win in this rat race, we’ll still remain a rat”. So, if this is the real deal, why not be the “fun rat” or the “adventurous rat” who has no regrets of not having his/her part of the fun. Take some time off for yourself. What to do after that you ask? Do what you’ve always wanted to do. Strike things off of your bucket list. We’ll help you strike one right away and if it wasn’t on your bucket list, after reading this blog it sure will be added. We are talking about Scuba diving. Scuba diving is such an unprecedented event that gives you a chance to go into a world that is so dreamlike that it frequently outperforms even our most out of control thoughts and dreams. Going deep into this submerged world, swimming past majestic creatures and exploring the underwater world is a just a sneak peek to this world which is so invigorating. Barracuda Point, Sipadan Island, Malaysia. This site is situated in the Malaysian Borneo, of the renowned Island of Sipadan in the Celebes Sea is an enchanting and enthralling spot that can be described as one of a kind and a flawless masterpiece! These days it is one of the 5 marine parks built up by the Malaysian government. There are over 3,000 types of fish around Sipadan Island and huge numbers of them can be seen at Barracuda Point. What’s more, there are hawksbill and green turtles, bumphead parrotfish and schools of enormous eye trevally. Not to forget the Barracudas, from which this point got its name. The specialty of this place is that Barracuda point is as yet one of the few spots left on the planet where you can experience twirling schools of jack fishes. These fishes swim as one and are splendidly synchronized as if they follow a dance routine every day. The scene of them swimming together is described to be breathtaking and can leave even a seasoned diver in awe. 2. Blue Corner Wall, Palau, Micronesia. As one of the top diving sites, Blue Corner is roughly 8m at its shallowest point and drops to about 30m. Blue Corner Palau is known for its variable flows which can alter course at any random minute. 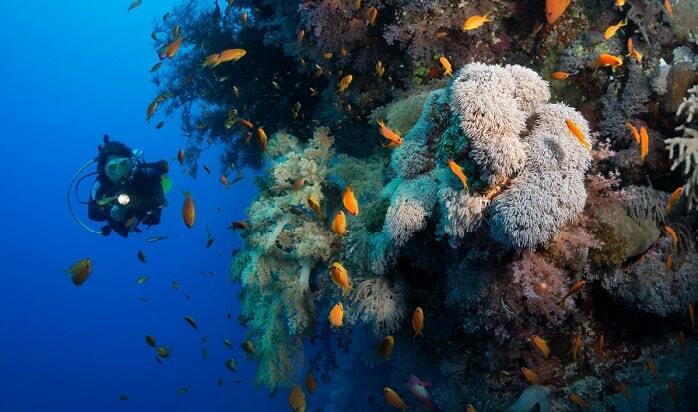 There are an extraordinary assortment and wealth of marine life to be experienced while diving into Blue Corner. 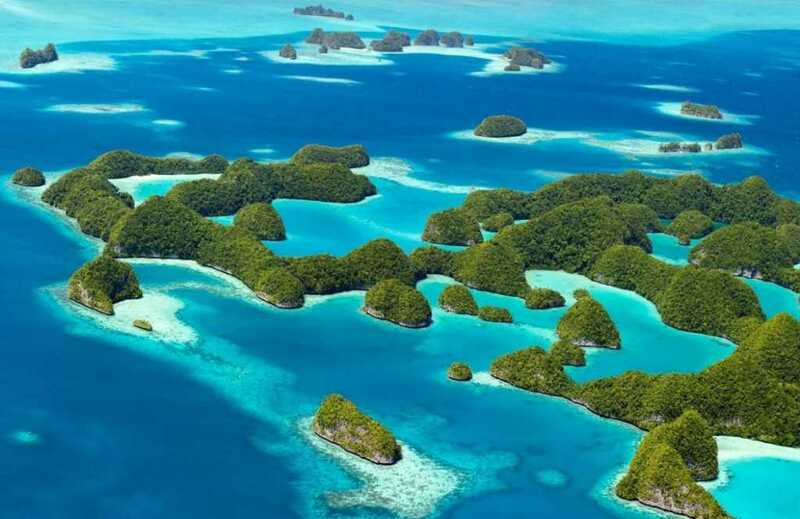 According to the NOAA (National Oceanic and Atmospheric Administration), Palau’s marine life supports 7 out of 9 of the world’s giant clams, 1400 species of reef fish, 300 species of soft corals and 400 species of hard corals. Also, Hawksbill and Green turtles visit the reef and so do Bump head parrotfish, Mackerel, Wahoo, and once in a while spotted Eagle rays. The SS Yongala is considered as one of the world’s best wreck dives. In 1911, this luxury passenger sank to be discovered only after 40 years and be declared a Scuba diving site. The marine life around the Yongala is breathtaking. You can spot Giant Groupers of the measure of a little vehicle, Eagle rays and Manta Rays coasting by, numerous Sea turtles, Sea snakes, colossal schools of Barracudas, Giant trevallies chasing around and different types of Sharks including the uncommon Bull Shark and Tiger Shark! If lucky enough, during the right seasons one can spot Minke Whales and Giant Whale Shark. This site is great when it comes to underwater photography. This spot is a treat for people who love mysteries and depth in terms of both water and history. You never know what you may discover. 4. Thistlegorm, Egyptian Red Sea. This is one spot that needs several dives to do it justice. We are talking about SS Thistlegorm, a British vessel which sank in 1941 when it was attacked from the air. It was carrying war supplies at that time which included Rifles, Motorbikes, Train carriages, and Trucks. The ship is to a great extent unblemished aside from the blast area where the bomb was dropped. The split body uncovers the priceless freight, where trucks, motorbikes, a train, and even Wellington boots can be seen. In order to explore the vessel, you’ll need two days of diving. The list of antique one comes across are two locomotives, two tanks, Army Trucks, jeeps, Motorbikes, Boots, stacks of rifles, and various spare parts for planes and cars. It’s almost like your history textbooks coming to life. Currents are quite unpredictable which can turn the dive into a bit of a challenge, but what is life without a bit of a challenge, isn’t it? Though the marine life around the vessel is limited, it’s a place for people who love to explore. Notable marine life includes Batfishes, a resident turtle, Barracudas, Snappers, schools of Jacks and all the usual reef fishes of the Red Sea. 5. Shark and Yolanda Reef, Egyptian Red Sea. Everything that helps Shark and Yolanda Reef qualifies as one of the top diving destinations is present here. From lovely coves, a huge number of reef fishes, coral nurseries, reef dividers, sky blue waters, to wrecks. The Yolanda is a cargo ship which sank in 1980. This ship was on its way to Aqaba with containers, cases of whiskey, wallpaper, bathtubs and the captain’s BMW 320. 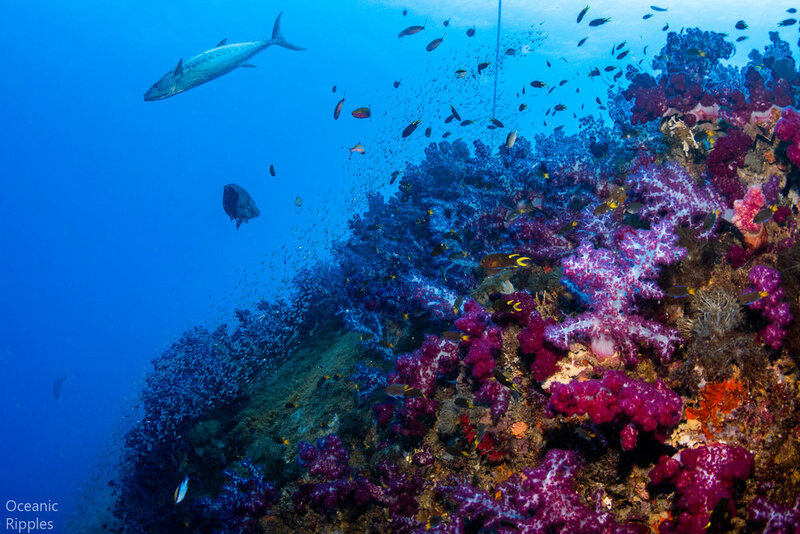 This popular dive is the one which will allow you to visit the beautiful Anemone city, the Yolanda wreck, and the Shark Reef in just one dive. To avoid the crowd, an early morning dive is recommended. If you are lucky enough, you may witness large schools of barracuda, jackfish and batfish. Snappers, emperors, large Malabar groupers can be spotted alongside of the wreck, as well as the large napoleon fish and fusiliers. The fauna here can leave you totally flabbergasted. Vast populaces of sea anemones cover the coral dividers which are home to such huge numbers of various sea anemone fishes. The light shade of the sand is hindered by the dazzling coral arrangements. 6. Manta Ray Night Dive, Kailua Kona, Hawaii. The acclaimed manta ray night dive in Kona is known as a standout amongst the most memorable dives in the world. The three locations where you can see the manta rays at the Big Island Manta Village, Manta heaven and Kohala coast are called “feeding stations”. The manta rays originally began going to these spots to eat the tiny planktons that were pulled in by brilliant lights that shone on the water either from inns or from divers. The manta rays feed on the planktons pulled in by lights and sift it through of the ocean by swooping through the water with their mouths wide open. While eating the manta rays swim, turn, and somersault effortlessly in the light giving you an extraordinary and an unforgettable night! 7. Great Blue Hole, Belize. The extraordinary Great Blue hole is one of the best tourist attraction and the most desirable diving spot in Belize. It’s an esteemed part of the UNESCO world heritage sites. 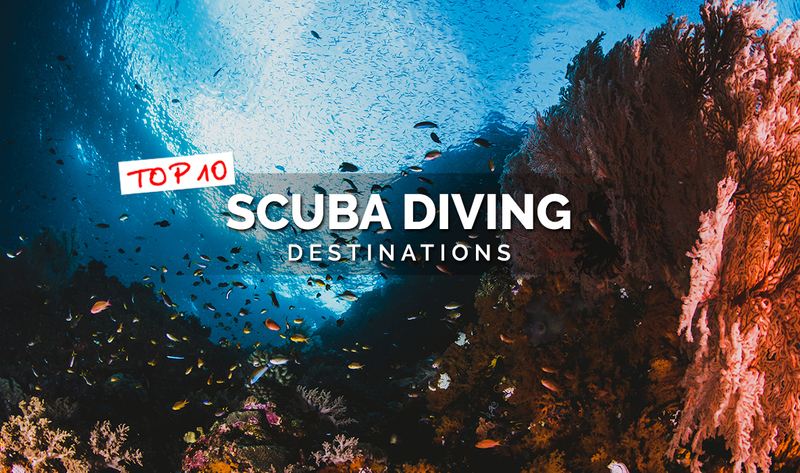 It isn’t just a world-class goal for diving yet additionally a rich territory for an assortment of marine life like nurse sharks, reef sharks, black tip sharks, and even giant groupers. 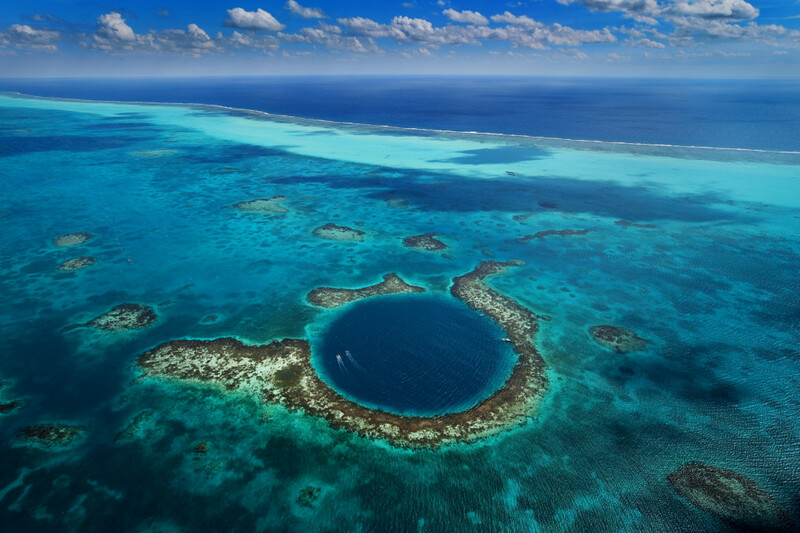 The Belize Blue Hole is splendidly round in shape, estimating 300 meters crosswise over and 108 meters profound. Diving jaunts to the Great Blue Hole are entire day trips, that normally comprise of one dive in the Blue Hole and two extra dives in the close-by reefs. 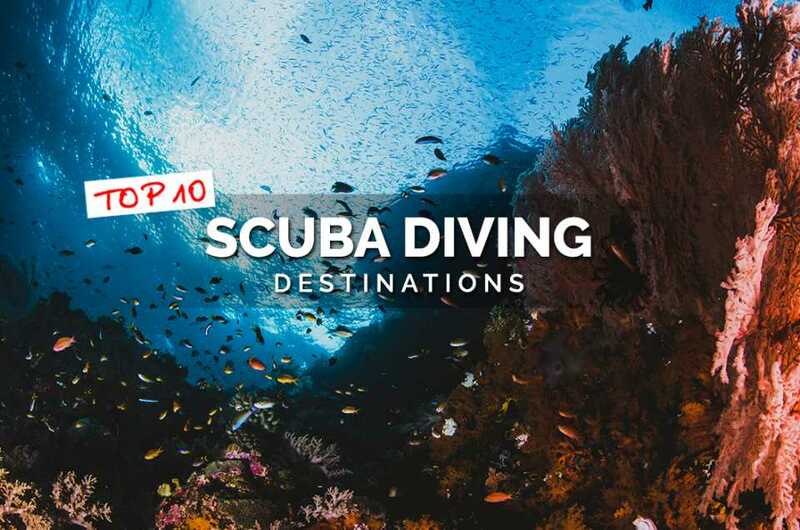 The best dive site of Thailand, a world acclaimed scuba diving destination, and even placed among the best dive destinations of the world, Richelieu Rock certainly satisfies its notoriety. Each square inch of the colossal rock that goes as low as 115 feet, is covered by beautiful delicate coral, joined by gigantic sea fans, hard corals and sea anemones. One can see tiny harlequin shrimps, ghost pipefish, tiger-tailed seahorses, peacock mantis shrimp, and frogfish often here, but what is astonishing here is that in every dive, you are bound to find something new. The scope for underwater photography is endless here. 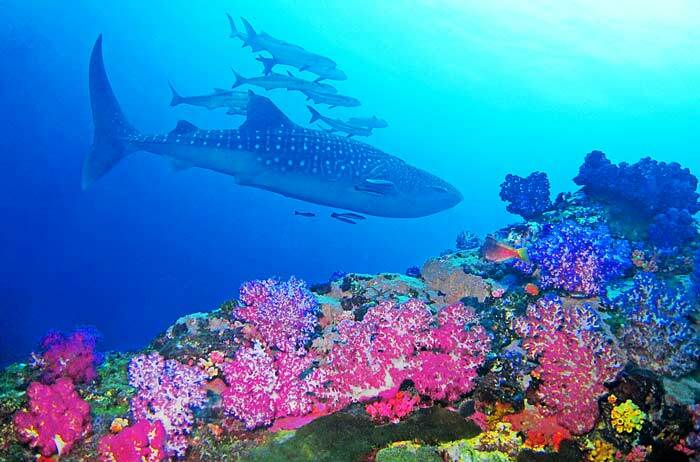 Richelieu Rock becomes your best bet when it comes to diving sites in Thailand because its nutrient-rich water and planktons attract many fishes including the world’s largest fish, the Whale Shark. Worth a dive, isn’t it? You’ll end up falling in love with this place and realize that even after several dives you have just scratched the surface. 9. USAT Liberty, Bali, Indonesia. The USAT Liberty Shipwreck in Tulamben has attracted divers from the world over to this calm beachfront village in East Bali. 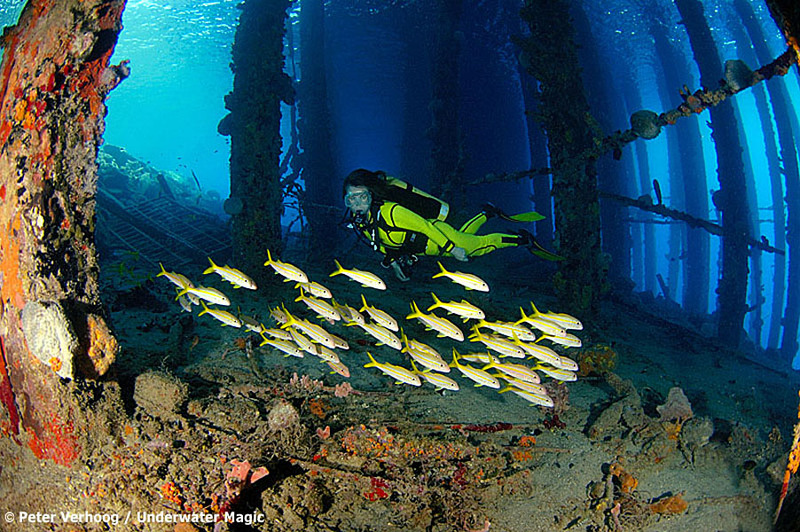 This well-known dive site revolves around the magnificent remains of the WWII-period US ship. This ship sunk in 1942 during a sea battle and was hit by a Japanese torpedo. Regardless of whether you are an amateur or an accomplished diver, this wreck is bound to attract you and leave a lasting impression on both your mind and soul. Also, the water is warm throughout the year. Many schools of fishes can be found here whilst diving. Some of them are the Big-eyed trevally, Gobies, Jacks, Lizardfishes, and Barracudas. Eel and giants clams are also found here in abundance. 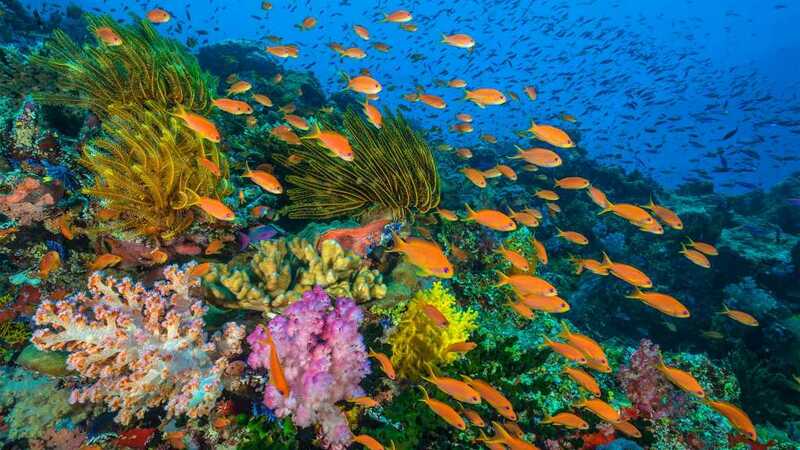 So, bring your cameras along with you for some amazing shots of this underwater paradise. 10. Navy Pier, Western Australia. Navy Pier has to be one of the best diving spots not only because it attracts many divers every year but is also described as the world’s best aquarium without a glass due to its varied marine life. At least 200 different species, including big schools of trevally, snapper, and barracuda, as well as graceful firefish, angelfish, Moorish idols and a Goliath grouper are regular sightings here. This dive site is a photographer’s paradise with a wealth of sea life that is apparently unafraid of divers. Night dives on the pier are equally amazing. It’s difficult to take your eyes off of the schools of fishes but if you look close into the pier structure is canvassed in delicate corals; divers could go through a few days in this diving site and not be exhausted because of the view at all. The varied marine life comes to you as a surprise because the dive is relatively shallow, going up to only 15 meters. The tidal range sometimes limits the access of divers which has resulted in fabulous and well-maintained biomass almost unblemished by the humans. This Pier has something for everyone, you may be an accomplished or an amateur diver, this place is bound to hold a place in your hearts forever.